When one is born from greatness, it’s almost expected that they’ll go on to do great things. In the case of Brigitte Lindholm, this involved following the footsteps of her inventor father, Torbjörn Lindholm. Of course, Torbjörn’s not just an inventor and the finest weapons designer the world’s ever known — he was also an Overwatch agent, back in the day. He’s one of the original strike team, brought on specifically for his engineering genius. In fact, his inventions turned out to be an integral part of bringing an end to the Omnic Crisis, and he continued to be a critical resource for tech needs and weapons systems. Of course, that didn’t stop the man from having a family life. Torbjörn and his wife had several children in between his work with Overwatch. He almost didn’t survive to see his youngest. On a routine mission to clear out a pocket of omnic resistance, the small strike team he’d been assigned to was ambushed. Although the team was able to bounce back and defeat the omnics with no casualties, Torbjörn lost his arm. Thanks to a timely save by his friend and teammate Reinhardt Wilhelm, he didn’t lose his life. Reinhardt and Torbjörn were longtime friends — Torbjörn was responsible for maintaining Reinhardt’s armor. While Torbjörn was in the hospital, Reinhardt spent hours at his friend’s bedside — perhaps being a bother, but with good intentions behind it. At that point in time, Torbjörn’s wife Ingrid was expecting another child — a daughter. Half in jest, Torbjörn told Reinhardt he’d let him name the child if he’d give him a few moments of peace. Truth be told, Torbjörn was considering making Reinhardt the child’s godfather anyway. And when she was born, the child was given the name Brigitte. 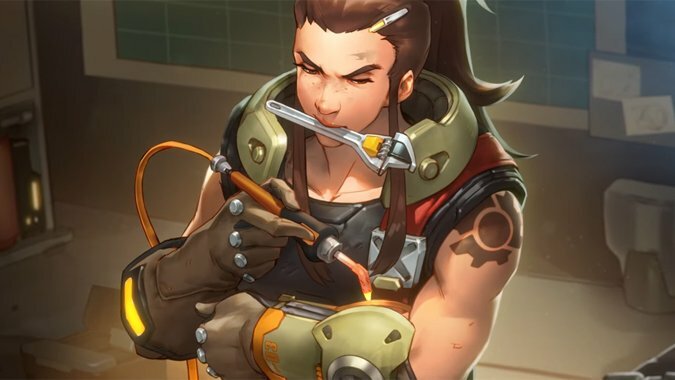 Although all of Torbjörn’s children came from the same family line, Brigitte was the first one to show any kind of interest in mechanical engineering. She was a natural, as talented as her father — but her leanings were more towards armor fabrication and defense systems than weapons. Reinhardt remained as close to the family as ever, telling young Brigitte tales of valor, honor, and chivalry. As she grew, everyone — including Brigitte herself — thought she would follow in her father’s footsteps as an inventor. At the same time…there was Reinhardt to consider. In his late fifties, he was summarily given mandatory retirement from combat operations. As Torbjörn put it, despite all of his years of service, Overwatch simply pushed Reinhardt out. After being removed from active duty, all Reinhardt could do was watch, sadly, as Overwatch descended into corruption, eventually disbanding in disgrace. But just because Overwatch deemed him too old to continue fighting didn’t mean that the fight had left Reinhardt completely. The old Crusader wasn’t about to let the world fall to disorder and darkness on his watch. With no organization to fight alongside, Reinhardt donned his old Crusader armor and vowed to fight for justice like a knight-errant of old — just like in the tales he used to tell to an enthralled Brigitte when she was young. Surprising everyone, Brigitte asked if she could join him in his journey, acting as his squire. 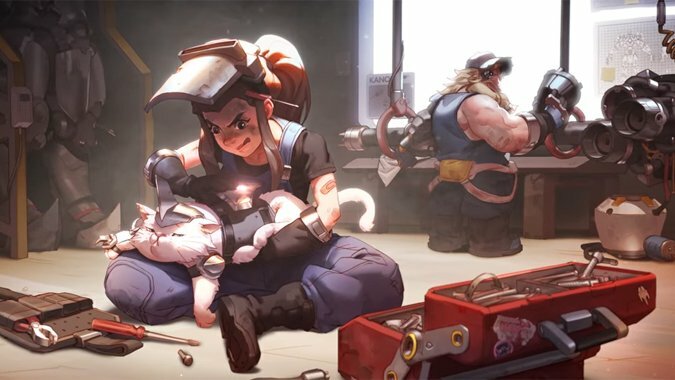 In that role, Brigitte was responsible for the upkeep and maintenance of Reinhardt’s Crusader armor. She was familiar with it already — it was her father’s design, after all. The two traveled, getting into various scraps and getting right back out of them again. All the while, Brigitte faithfully repaired Reinhardt’s armor as asked. But that wasn’t really her only role — she found herself tending to her godfather’s wounds just as frequently as she tended to his armor. Perhaps if Reinhardt were younger, simply being a squire would’ve been enough. But despite his unwavering youthful enthusiasm for defending the innocent, his body was breaking down from all the years of combat. Serving just as a mechanic was helpful, but limited. 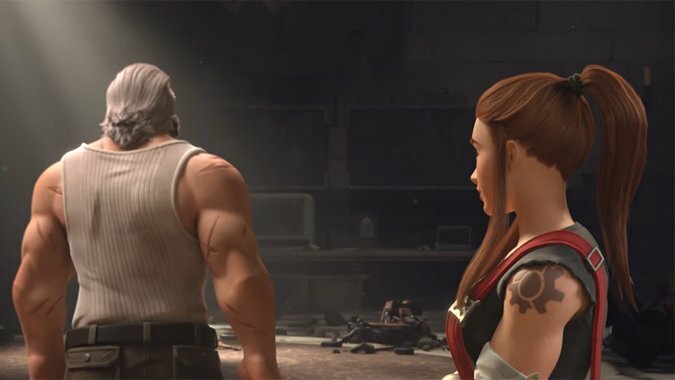 Fighting alongside her godfather, though… in that, Brigitte could be more helpful. Reinhardt trained her in combat, and in secret, she began constructing her own suit of armor. Despite his forced retirement, Reinhardt was still a member of Overwatch, in days past. As a former agent, he received Winston’s recall order just like everyone else that once served on the duty roster. 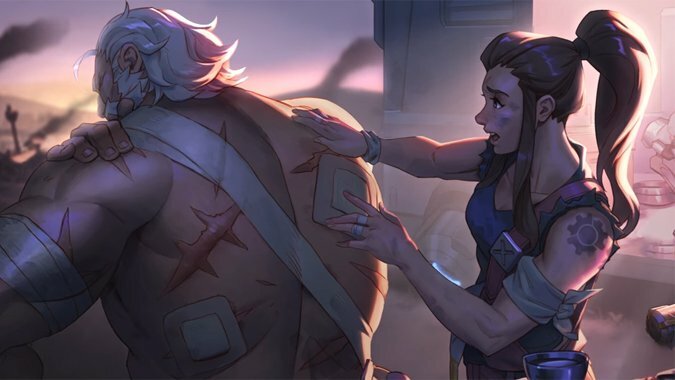 At that point, the two were traveling in Greenland and had an unseen discussion in which they’d agreed — or at least Brigitte had agreed — that the recall wasn’t meant for Reinhardt. He’d been retired, after all. They pushed him out. But some time later, the two ended up in Eichenwalde. The place was steeped in history — Reinhardt’s history. It was here he’d fought his last battle alongside his mentor Balderich von Adler, it was here Balderich died in one last stand against a group of deadly OR14’s. It was here that Reinhardt lost his eye. And it was here that Balderich, in one last quiet moment before his death, passed on his Overwatch acceptance medal to Reinhardt. Balderich couldn’t answer the call — but Reinhardt could. That fateful battle made Reinhardt everything he was today. And although Brigitte was against the idea of Reinhardt going back to Overwatch, he was reconsidering his decision. In the end, the answer was simple — he’d been called. He had to answer. Always. If the world needed protecting, he’d gladly expend his last breath to protect it. Eventually, Brigitte finished work on her armor. Now she fights at her godfather’s side — and what better role model could she possibly have? 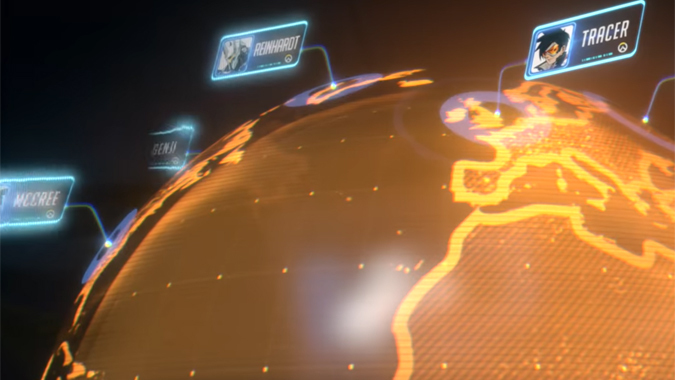 Brigitte doesn’t appear to be an official member of Overwatch. It makes sense — the recall was for former members, and it was illegal, after all. But should Overwatch see a true resurgence, I suspect Brigitte will be on that new roster. There, she’ll follow in her father’s footsteps…perhaps not quite in the way he’d intended. However, it’s doubtful Torbjörn would object too strongly to that arrangement. Her presence means his dear friend Reinhardt has his clever daughter to keep the old man alive. And Torbjörn knows that Reinhardt will keep her just as safe. In a world teetering on the brink of darkness, there’s no better pair suited to make it a better place, one battle at a time. This isn’t the first instance we’ve seen of family connections in Overwatch. 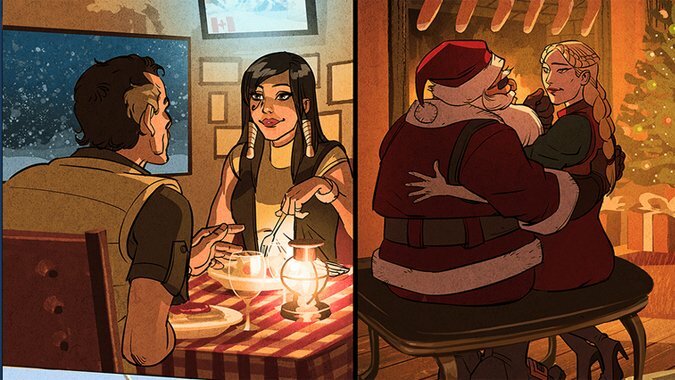 Ana Amari is Pharah’s mother, long thought dead — and Pharah still has a father we’ve only seen a glimpse of in the Reflections comic. Obviously we’ve also seen the Shimada brothers — while Hanzo isn’t a member of Overwatch, his brother Genji has been seen trying to forge a reconnection. And in some ways, the Overwatch organization itself was one big family. A very weird family, but family nonetheless. Its members still keep in touch, despite the organization’s disbandment. And hey, after everything they’ve been through, who can blame them? They shared a unique moment in history, experienced the best and worst of what the world offered. Just because the world said they couldn’t fight anymore doesn’t mean they can’t still catch up and reminisce about the old days. Brigitte was raised in a family of greatness, perhaps expected to do great things. At her godfather’s side, she’ll carry that out. Not because of destiny, or any expectation, but out of love. Saving the world is enough to bring anyone together — and family is just one of the things that make the world worth saving.